Stile Antico has made a specialty of sacred music of the 16th century, especially of English composers. That focus (from 1507 to 1598, in this case) continues here, but the center of gravity shifts (at least temporarily) to Hapsburg Vienna. To be sure, the span goes beyond Maximilian I to the next three generations of Hapsburgs, Mary of Burgundy, Charles V, and Philip II. Maximilian’s court composers Heinrich Isaac and Ludwig Senfl find places here. Isaac’s motet, Virgo prudentissima, was written in 1507 for the Reichstag which confirmed him as Holy Roman Emperor, and Senfl arranged Costanzo Festa’s famous lament Quis dabit oculis nostris for his funeral. Philip II is represented by Jacob Clemens non Papa’s Carole magnus eras, which was composed when Philip was named as his father’s successor in the Low Countries. Philip’s acquaintance with Thomas Tallis at the Christmas Mass of 1554 accounts for the presence of his motet Loquebantur variis linguis, which shares its seven-voice scoring with the Mass sung on that occasion. (I’ll bet you were wondering how Tallis found his way into this program.) Philip’s death in 1598 was the occasion for Alonso Lobo’s familiar funeral motet Versa est in luctum. The program is not arranged chronologically, but rather bookends the disc with two vigorous motets, the Morales and the lengthy Isaac, with Gombert’s long Magnificat in the center. The program is a mix of familiar and less familiar music. Versa est in luctum is a close match for the version by Nigel Short (Fanfare 35:2), but there are many other fine recordings. Quis dabit oculis nostris, an arrangement of Festa’s lament on the death of Anne of Brittany five years earlier, was recorded most recently by David Skinner (33:1). Carole magnus eras has been recorded in the superb Clemens non Papa program by Stephen Rice (29:1) and in a couple of collections. The Tallis Loquebantur variis linguis is familiar on records from Andrew Carwood, Alistair Dixon, Jeremy Summerly, and others. Among the less familiar works, Jubilate Deo was recorded by Alistair Dixon (29:1) and Virgo prudentissima was beautifully rendered by both Henry’s Eight (23:3) and the Tallis Scholars (15:3). Andreas Christi famulus, a text also set by other Burgundian court composers, enjoyed two recordings by Alistair Dixon (again, 29:1) and Peter Phillips (24:4). La Rue’s Absalon fili mi is probably a first recording, a setting of Saul’s familiar Scriptural lament for his son, a text used on other occasions of the death of a ruler’s son. The word setting is poignant, ending with a morendo on the word plorans (weeping). 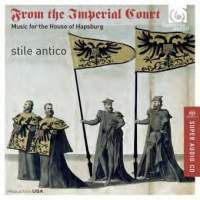 In every case Stile Antico is the equal of the best recordings cited. The 16 singers make a larger ensemble than most of the other vocal groups cited, but they sound like the smaller ensembles. This is a marvelous collection of music spanning the entire century with a clear focus on the dynasty. It is the combination of astute programming and exquisite performance that makes the disc so entrancing. Don’t miss it.